A worldwide first, the Losi® Mini-Rock Crawler utilizes design elements from real-world rock-crawling competitors. A multi-link suspension and solid 4mm axles provide the ultimate combination of lightweight agility and strength. The full-time 4WD drivetrain powers all four wheels through a center-mounted 3-gear transmission with a spool and slipper, providing grip and torque at each and every wheel. The positioning of the transmission provides the Mini-Rock Crawler with outstanding balance for tackling the toughest climbs and maneuvers. Heavy-duty metal ring and pinion gears, solid axles and axle shafts combined with a full set of ball bearings provide the Mini-Rock Crawler with durability for extreme, precision climbs. On top of the outstanding handling elements, Losi has loaded the Mini-Rock Crawler with the electronics you need for serious control and torque. An LSR3000 radio system with genuine Spektrum™ 2.4GHz DSM® technology provides crystal-free, no-interference control and a lightweight transmitter design. Power comes from a high-torque Losi electric motor, controlled by a Crawler-tuned forward and reverse electronic speed control that keeps the Mini-Rock Crawler smooth and stable on the most uneven terrain. An extra amount of drag brake was added to hold the vehicle in the steepest of grades. The Crawler also features a high-torque rock crawling-specific servo packed with power. 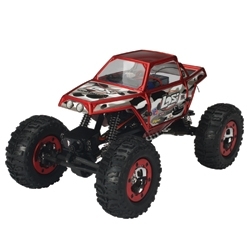 To fully achieve the scale look of the full-scale rock-crawling machines, Losi designed a tuber-style body in red, blue or black. To provide the traction that rock crawling demands, Losi adapted their unbeatable 1/10-scale Rock Claws™ 2.2 tires for the smaller size, resulting in Mini-Rock Claws tires. Mounted to beadlock-style wheels, the Mini-Rock Crawler can clamber and climb nearly any obstacle with ease. With a rechargeable battery pack, wall charger and alkaline transmitter batteries included, the Mini-Rock Crawler is the only choice for ready-to-run rock crawling performance.